I really should update my blog a bit more often than I already do (which is once a month, apparently). January has gone by so fast already and my projects are flying off the needles. I released the Caprius Shawl at the beginning of the year, and it was a really successful pattern. It was a really encouraging and exciting experience - local yarn stores would share the pattern on their facebook pages and the feedback was overwhelmingly positive! I was very touched when I received an email stating that someone had purchased the pattern in person at the LYS that I first went to and frequented often when I lived in Austin, Texas. As you can see from the first image, it has been snowing quite a bit here and even when it's not, it has been rather cold. While this is my third time living Japan, each experience has been different and this one has provided challenges of its own. My language abilities are not as good as I would like it to be so making friends is difficult. Additionally, the majority of the people living in the village are elderly people... all very nice and courteous but the age difference does put a huge block on how you can relate to them. Going out can also be a hassle as driving to nearest town is at least 20-30 minutes... driving to areas with shopping outlets and decent restaurants requires around an hour of driving (which is also made slightly more annoying with single lane roads meaning you will be stuck behind a slow driver forever). Not being able to meet and talk to people in person and being so far away from the everyday conveniences that I'm used to, in addition to the special type of grey lull that winter brings has equated to me having to fight off depression once again (the last time I was depressed was when I was studying in France in winter of 2012. Huh). Thankfully, I have a lot of things in my life to be grateful for, such as my husband, who continues to be understanding, caring and loving. I'm also grateful that the knitting community has a large and strong presence online and on Instagram! I've been able to talk and meet knitters from around the world. I've been able to chat with people on Instagram and through Ravelry. Just last week, I stumbled across a blog post where the author highlighted some of their favourite IG accounts and why - and I was floored to see my name in the list! (Give the post and the rest of their blog a read! It's a delight!). Then this week, I received a small shock when indie yarn maker Julie Asselin purchased my Ngaru Hat pattern! I had been eyeing her yarns for a while and had been following her work on IG (so needless to say, she is one of the yarn goddesses I admire). While I have been working hard on creating accessible patterns and getting them the most exposure as possible, actually seeing the results slowly but surely pay off that work is still exhilarating. I only have you, knitters who support and purchase my work to thank. You are the best. I know I haven't been active much (I'm so sorry!) lately. I'm preparing to move to Japan in less than two weeks while still trying to finish up some knitting projects so that my suitcase won't be so full of yarn! But some good news before my post. My Seashell Shawl has slowly continued to sell and the photos of the Smocked Pullover was featured on the Vogue Knitting facebook page! Here is a new test segment that I'm trying out; "Lessons I've Learned While..." Every knitting project I've done has taught me some extremely lessons, whether it be new knitting techniques, things to watch out for or just some random tidbits that knitters could also enjoy. 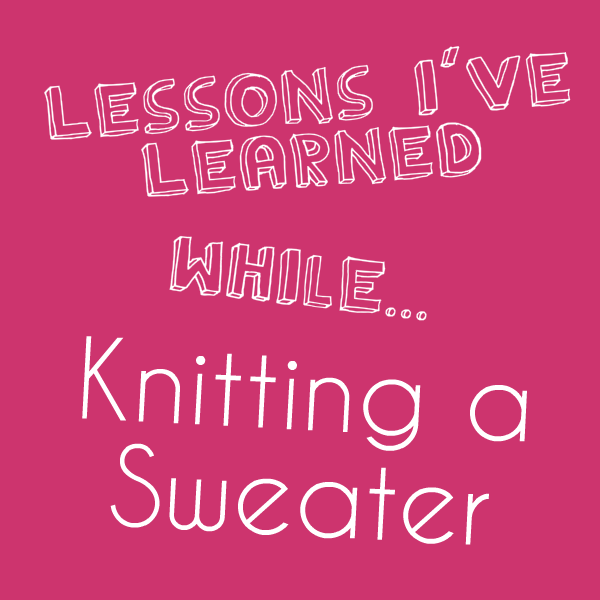 So, without further ado, here are the lessons I've learned while knitting a sweater/pullover. It only takes 30 minutes and saves a lot of time and heart ache later. Additionally, getting ALL the right measurements for a fitted garment goes a long way. When in doubt, re-do it. Especially when it's not for you! If something looks funky or off, or if confronted with the question "Should I continue and hope it looks ok, or should I redo it? ", it's better to redo it. I accidentally cut the yarn to the smocked pullover but was able to catch the snipped threads before they unraveled themselves. Unfortunately I was then confronted with a choice: try to tie them up neatly and hope they stick (while suffering from stress for the rest of my life from the nonending fear that the pullover might come undone), or unwind ALL the stitches and redo them (and sleep soundly at night). It was a tough decision, but I redid it and was able to breathe properly. I get so invested in my knitting I end up eating 1 1/2 square meals in a day, and too often these meals get spaced heavily apart. Bad habit, must break, don't do again. If your stomach is rumbly, feed the tummy! Bad tv shows cause my tension to tighten (and my blood levels). Not good. However, the really good ones catch my attention so well I pay more attention to the show than my project, which ends up left on the way side (Orange is the New Black anyone?). I find that anime or nostalgic tv shows are the way to go! If the garment is two pieces fitted together, copy what you do on one side the exact same on the other. Don't take shortcuts. Try to keep the tension and techniques used as close as possible. Breathe. Everything will be ok. Believe in yourself and your talent! Getting stressed over the little details is not worth it.